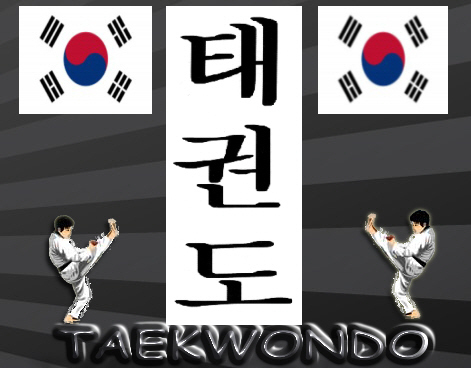 Taekwondo a devastating Kicking art from Korea 'which of the traditional arts is one of the youngest at least that's what your led to believe ,but in fact it was developed centuries ago and was known in those days as tae kyon. A Buddhist monk named Won Kwangis said to have developed the principles that to this day remain evident in modern Taekwondo.It was developed as a means of self defense for tribal groups who where at threat from neighbors,and dates back over a thousand years.But as Taekwondo in the modern world well we have to go to 1955 when General Choi Hong Hi at a conference of masters submitted this Taekwondo name as it resembled the original tae kyon name. And it's Japanese influence is evident because of the occupation of Korea between 1907 and 1945 of which most of the that time 1909-1945 the practice of martial arts was outlawed. But we all know as with China also that people secretly practiced their art otherwise a lot of arts would have vanished.After the war the top Korean masters came together to unify to create a National art Korea could be proud of 'Taekwondo was born on the 11th of April 1955'. 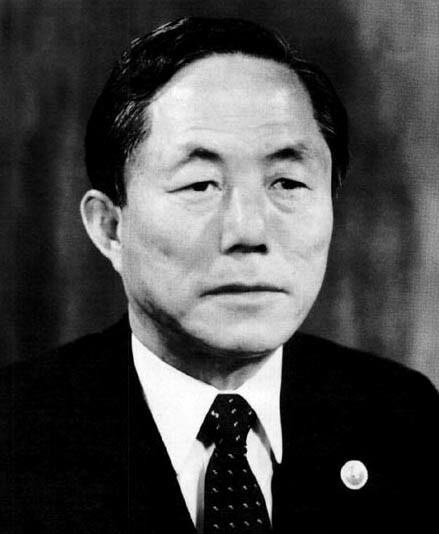 Now with two main styles of Taekwondo ,there are some differences ,General Choi Hong Hi was born in Japanese occupied Korea in 1918 in the Hwa Dae, Myŏngch'ŏn county (Which is now in North Korea) ,after the war of Course Korea was split and though Choi Hong Hi was one of the Twelve original masters who formed the Korean Taekwondo association (KTA) ,and had traveled to promote Taekwondo he was forced to resign from the post of President of the KTA only after a year of being appointed ,due to his Authoritarian way of teaching. 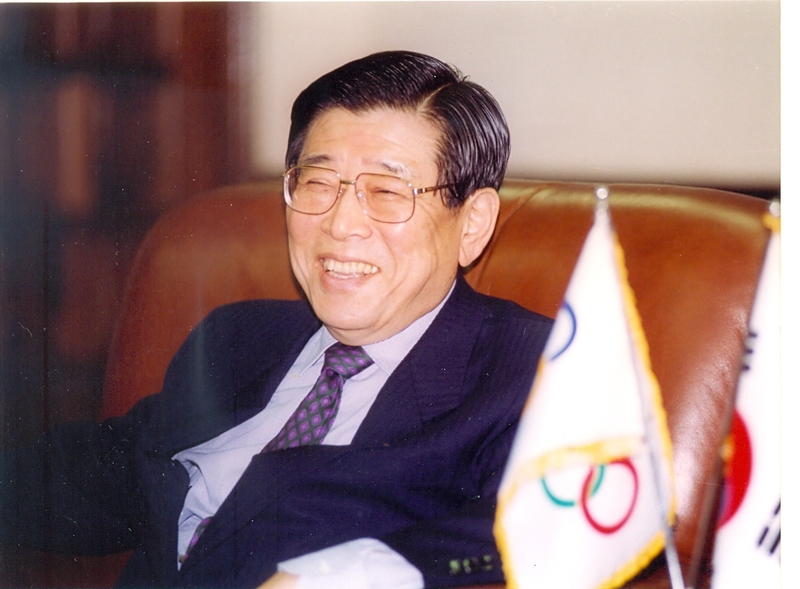 In January 1971 Dr,uUn Yong Kim was elected President of the Korean Taekwondo association and under his leadership the W.T.F was born. 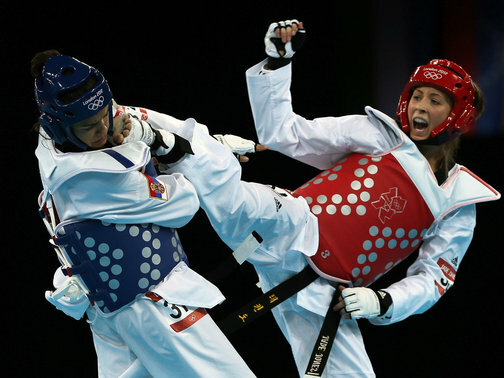 In 1980 Taekwondo was recognized by the IOC as an Olympic event and was demonstrated at the 1988 and 1992 Olympic events. And in 2000 became a fully fledged Olympic Event. 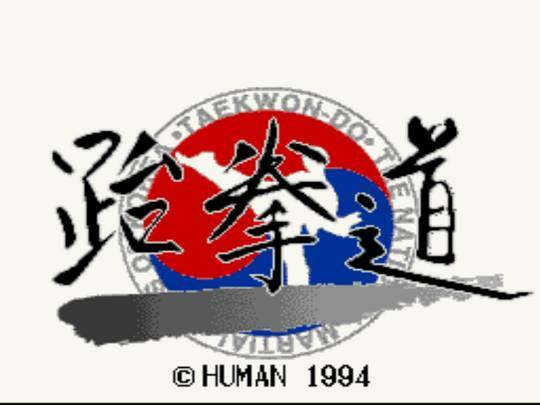 It seems there will be no union of the two forms of Taekwondo (Not in my lifetime anyway) General Choi Hong hi resided in Canada up until the year 2000 ,after this he went home for his final days ,of course home now was North Korea ,he died there in 2002. 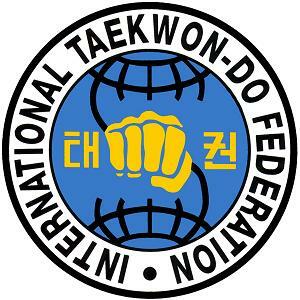 Around the World it's a different matter people all around learn Taekwondo .some ITF ,others WTF. 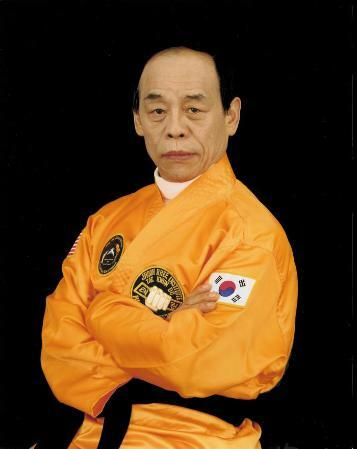 there will always be differences within systems ,but i for one thinks you can not ignore General Choi Hong Hi ,because with out his vision of Taekwondo and he bringing together and being part of the original twelve masters ,would we have 'Taekwondo''? 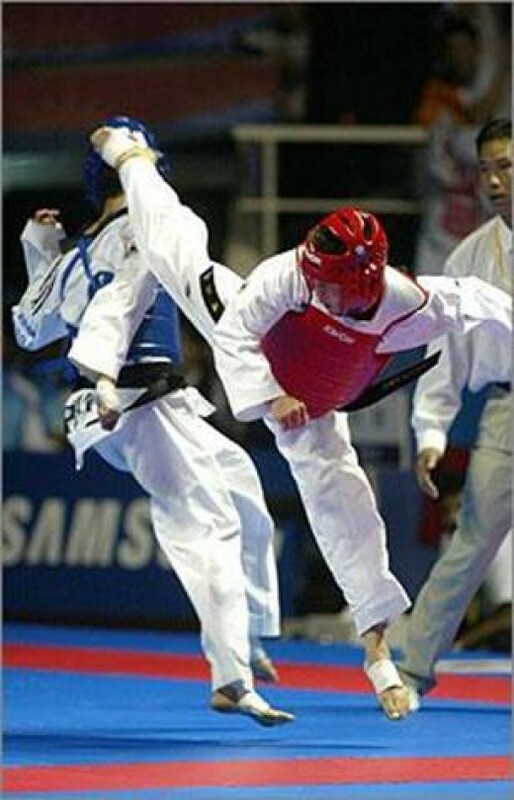 So Taekwondo a very kick orientated art that has lots of flashy but powerful kicks along with punches and strikes which resemble some boxing traits dependent on where and who you train with. From a Olympic point of view the punches are less evident and all is about landing those kicks for points ,but from a traditional point of view where all limbs are used in a 60% kicks and 40% punch combo ,you have a devastating self defense. No other art has kicks as powerful as Taekwondo as practitioners of the art are taught certain ways to produce these kicks and along with specific stretching techniques for Taekwondo to get the desired effect from it's Disciples. 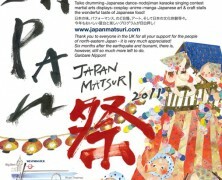 *our thanks go to Harts Taekwondo for some of the images. With a varied selection of kicks in the Takwondo arsenal ,there should be no shortage of any particular practitioner failing to perfect a good range of kicks.Of course in studying Taekwondo you will learn all relevant kicks ,but as with all people ,each individual usually favors a certain kick over a other. 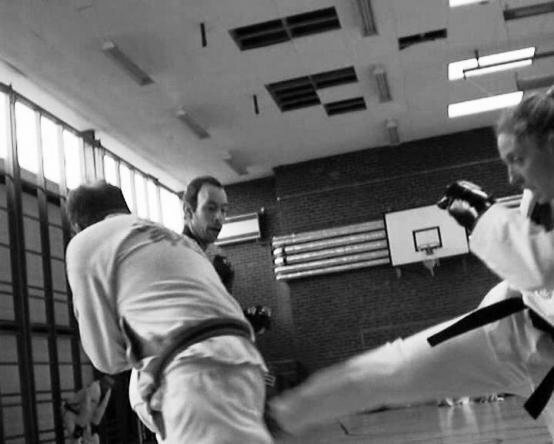 Front Kick - The first kick taught in Taekwondo is a very linear kick ,Normally using the rear leg you would raise your knee to about waist height and then extend the leg in a snapping motion whilst maintaining posture and pulling toes back .The effect would be to push away your opponent,but performed perfectly with power can be a devastating kick. 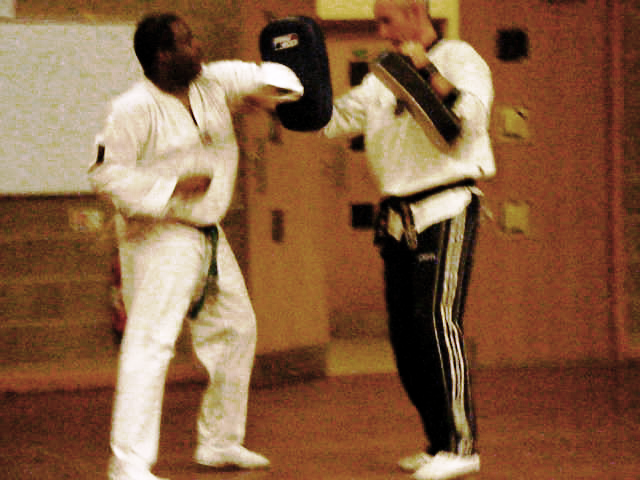 Side Kick - The action is similar to the front ,but from the side.you would simultaneously raise the knee and turn 90 degrees before extending the leg to unleash the kick. 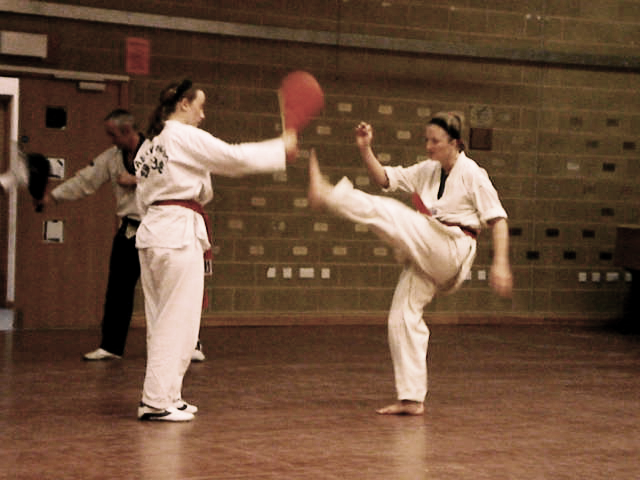 Turning Kick - Often referred to as the roundhouse kick ,with this you raise the knee and turn whilst pivoting on the other foot,you would angle your self across your target 80 degrees or so and extend and kick with the instep or in other cases the ball of the foot , as with the front kick pulling back the toes when utilizing the ball of the foot. Back kick/Horse Kick- this kick sees you turning away from your opponent to face the other direction,you kick out behind yourself with the rear leg using the heel of your foot as the impact point.This is all done while looking over your shoulder. A very powerful kick if performed right but you may find yourself of target at the beginning of learning this kick as you over turn out of target and maybe lose your balance. Back side kick /reverse side - Performed in the same way as the back kick but this time you spin more in to it so that you kick using the heel of the foot as used in the side kick. Hook Kick - Not the easiest of kicks .but one which has it's fans (Bill ''Superfoot'' Wallace springs to mind) Here the action is similar to that of the turning kick/roundhouse kick ,but instead of kicking with the instep or ball your intended point of impact is the heel,Turning in the same manner as the turning kick you circle the leg in a dorsal arc and whip it back using the heel to hit the target. Axe Kick - With this kick good flexibility is required to perform it correctly ,coming of the rear foot the leg is raised straight up with the toes pulled back and the point of impact being your heel.You would use this to strike atop a opponents head,shoulder or chest,the main target of this kick is the collar bone which would break easily from a good axe kick. Crescent Kick /outer and Inner - Here are two versions of the same kick ,with the outer the practitioner raises the leg as high as he can and performs a arc outside of the body ,the point of impact would be the center line of the body. With the inner the the arc starts earlier and the height of the leg comes after the start of the arc ,impact could be anywhere across the body ,the nose /head or even the side of the body. 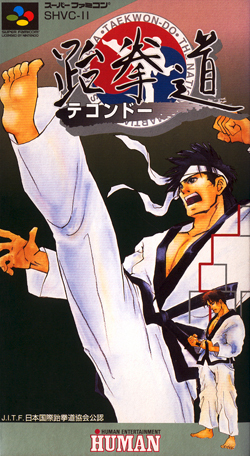 Spin Kicks - spinning kicks involve completing a full spin before unleashing a kick ,Spins can be utilized with most kicks mentioned above as can Jump Kicks and Spinning Jumping Kicks. Tornado kick/360 kick/Screw kick/windmill kick :The exponent steps forward then spins in the direction of their back leg while raising their knee and jumping to perform a spinning inside crescent kick in midair. 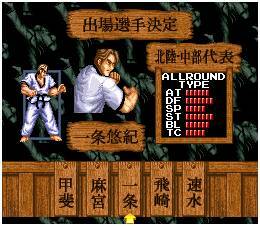 the alternate version involve an initial round or crescent kick, while the back foot pivots. rotating the body in a 360 motion, the back foot comes up as a knee and swings across giving the momentum for your attacking leg to do a roundhouse kick or an inside crescent kick. So there you go a outline of some of Taekwondo's most favorable kicks.Of course there are others like the Twisting Kick and stamp kick ,but if your just starting out the above should give you enough to work with. 10th kup White - Signifies innocence, as that of the beginning student who has no previous knowledge of Taekwon-Do. 8th kup Yellow - Signifies the earth from which a plant sprouts and takes root as the foundation of Taekwon-Do is being laid. 6th kup Green - Signifies the plant's growth as Taekwon-Do skills begin to develop. 4th kup Blue - Signifies the Heaven towards which the plant matures into a towering tree as training in Taekwon-Do progresses. 2nd kup Red - Signifies Danger, cautioning the student to exercise control and warning the opponent to stay away. 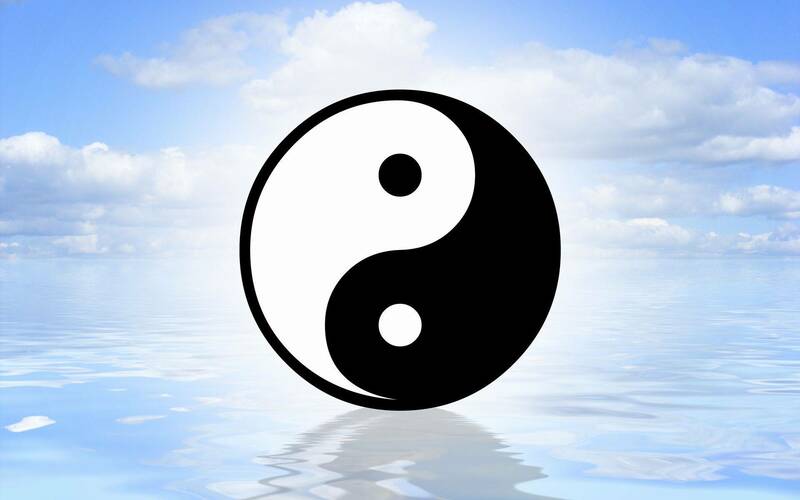 1st dan Black - Opposite of white, therefore signifying maturity and proficiency in Taekwon-Do; also indicates the wearer's imperviousness to darkness and fear. 4th dan International Instructor (must remain at this rank at least 4 years). 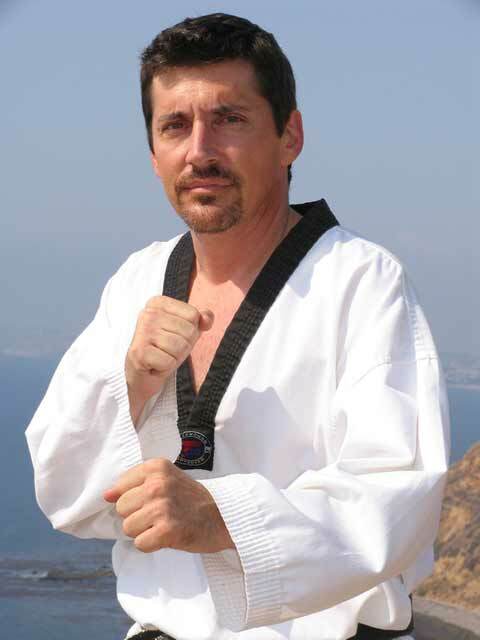 At this point, a person may become a "SaBum-Nim"
Many great Taekwondo masters exist,but if your in to Taekwondo ,there's one man you need to get the lowdown on and it's the one and Only Silver Fox himself. A army Taekwondo instructor his feet are a lethal weapon ,he is Hwang Jung Lee. To find out more on Master Hwang Click Here! Tan Tao Liang or Grandmaster Tan as we should call him is a masterful exponent of Taekwondo who came to fame in the Seventies in many films that showcased Taekwondo.Being also a teacher he went on to train the Legendary John Liu of Secret Rivals fame who was a also a real life combatant who went up against Chuck Norris in the ring and won.Grandmaster Tan was born in 1947 in Pusan Korea but his family originated from the Shandong Provence of China. Tan also went on to open Taekwondo clubs in California whilst living there but is believed to be living in Taiwan now. Also known as Flash Legs Tan due to his hopping kicking ability which he developed for competition.And even a film was made called Flash Legs. Other Students of his where also Yuen Biao and Shannon Lee ,daughter of the late Bruce Lee. 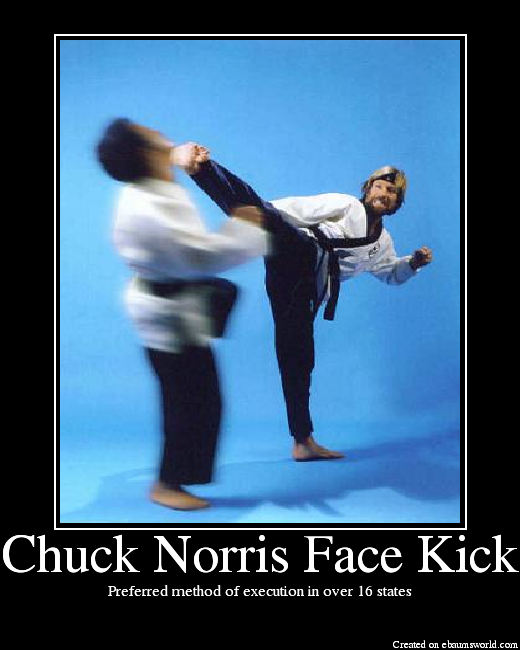 Yes Chuck Norris grounding in martial arts is Taekwondo ,he started to learn when in the Military based in Korea.If you observe Chuck in action you will see classic Taekwondo being performed ,even though he has devised his own art based on his background ,it still holds true to Taekwondo.TO learn more about Chuck Norris Click Here. Yes one of our banner stars and Champion Tang Soo Do and Taekwondo exponent Cynthia started training Tang Soo Do from a young age ,being a forms and weapons champion five times ,she got the call for Hong Kong and became the only Caucasian to have leading heroic roles in Hong Kong films. Also having trained in other arts such as Kung Fu Cynthia is a Champion in pushing self defense for women and currently teaches in California. Loren Avedon came to fame in the Sequel to No Retreat No Surrender ,The aptly named No Retreat No Surrender 2 ''Raging Thunder. 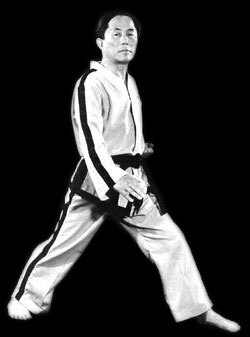 He replaced Kurt McKinney from the first ,and what a Bonus that was ,as it gave the world a chance to see the top Taekwondo skills of this unique individual . Trained by some of Taekwondo's greats he currently holds a 5th Dan in Taekwondo on top of this he is also a 8th Dan in the Korean art of Hapkido. A selection of films that all fans of Taekwondo should see .some are full on out Taekwondo flicks ,others maybe feature some good Taekwondo or maybe a famous Taekwondo star or all of the above. When Taekwondo strikes - Taekwondo master Jhoon Rhee stars in his only film alongside Angela Mao ,who is a Hapkido Black Belt. Best of the Best - Phillip Rhee and Simon Rhee star with Eric Roberts in this story of a group of Americans coming together to compete against Korea's finest. Spin Kick - A Korean Film about the teachings of Taekwondo and how a collage team enter the national competition. No Retreat 'No Surrender 2 - Loren Avedon stars in this Sequel to the first with Cynthia Rothrock,both are Taekwondo experts and here they go up against their foes in the form of Matthias Hues and his side kick the mighty Hwang jung Lee. 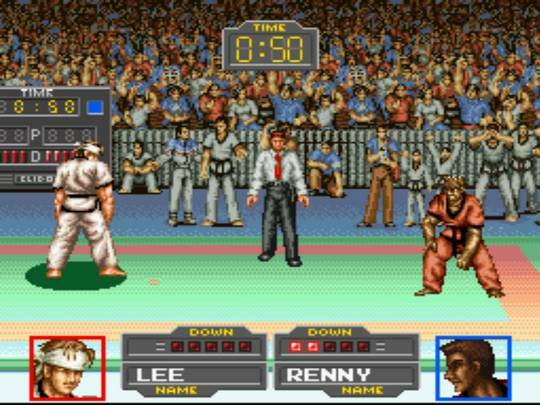 Secret Rivals - A Old School classic with Hwang Jung Lee. Drunken Master - Hwang Jung Lee is Jackie Chan's adversary in this must see movie. Drunken Master 2 - more then ten years after the original Jackie Chan returns to the story ,this time with his friend and Bodyguard in tow ,Taekwondo man Ken Lo. Chocolate - Jeeja Yanin a third degree Black Belt in Taekwondo stars in this awesome film from Sahamangkol. The Kick - Sahamongkol Joint production Koren Taekwondo film ,the film features four experts in Taekwondo ,is sanctioned by the World Taekwondo Federation and on top of that Jeeja Yanin also stars. These are just a few films for you all to track down and see. 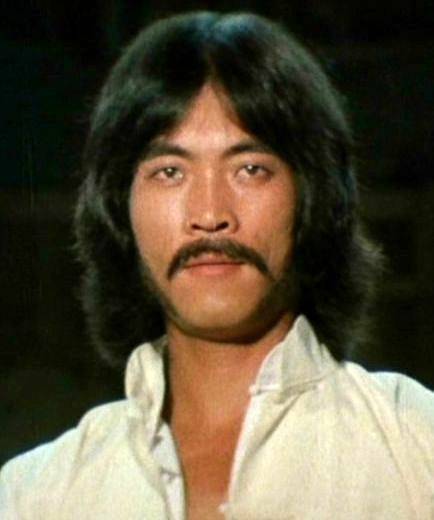 Of course any film with Master Hwang Jung Lee is a must ,the full list of his films is listed on our feature page of the great master. But also look out for films starring John Liu , Tan Tao Liang, Silvio Simac ,Bill Wallace to name but a few. 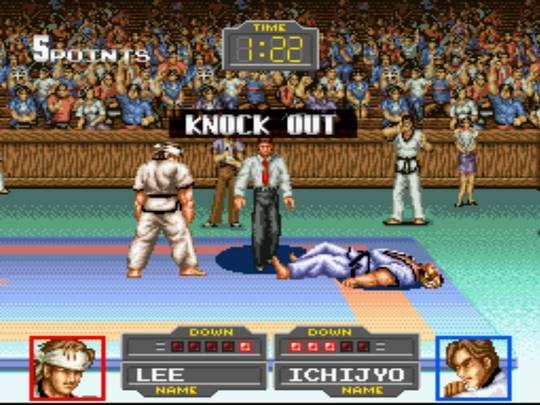 Only one game to my knowledge has been made on the art ,released in Japan and Korea only .This video game by HUMAN was released on the Super Famicom (SNES) in 1994.